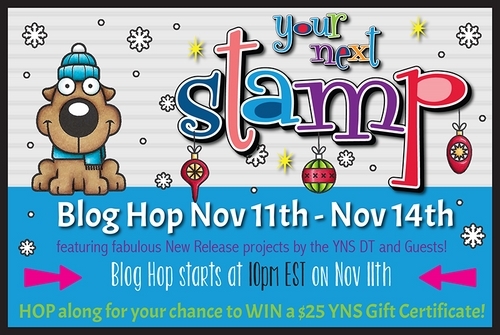 Hello everyone and welcome to the Your Next Stamp (YNS) November release blog hop! I went for a clean and simple design using fresh colors. I started by sponging the background using Peacock Feathers Distress ink. I stamped the image in black ink (without the hanging heart that I masked with tape before inking and stamping), colored it and cut it with scissors. It took time and patience to cut it but the result is so beautiful. It was worth it! I added a rainbow strip on the left corner for a touch of extra colors and adhered the branch with the birds to the sponged background using foam pads for more dimension. The tiny and super sweet speech bubble is from the Tweet Kindness set too. One random winner will receive a $25 gift certificate to spend in the YNS Store. If you leave a comment on all of the blogs, you could win this voucher! The name of the winner will be posted on the YNS blog on November 16th. Now it's time for you to head over to the next stop (links are below) but don’t forget to leave a comment before you go for your chance to WIN! I hope you’ve enjoyed your stop here today! Thanks for stopping by! This is so well done! Very cute! Such a sweet card! I bet it was fun to color!!! I love all the sentiments in the stamp set you used! Fantastique carte ! Les couleurs sont magnifiques, et effectivement, découper un tel motif a du être un sacré travail de précision. J'adore ! Love the Peacock Feathers distress ink in the background. It makes the birdies pop. Adorable! this stamp set, being a birdie lover! So sweet! And such pretty colours too! Love these birds! Fantastic coloring job! I love this adorable stamp. 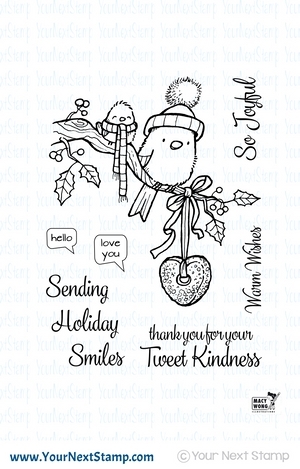 What a lovely image to colour in so many variants and make into holiday cards! Awww, what an adorable stamp! Your card is gorgeous and so beautifully coloured. That's such a sweet little bird ! Your colored the sweet birds so beautifully! This is a lovely stamp set. Love the Tweets stamp. Your coloring is amazing! This is a fun set, and I love how you sponged on the blue background. The layout is very inspirational. I love the birds so much that I just ordered the stamps and dies! I adore this stamp set and you have made a great card with it!! Très belle carte. Très douce ! Lovely! i just love this stamp! What a sweet, sweet. card!! What a cutie! I so enjoy your cards and having you join us for the release. Love these birds. There are so many great sets in this releases. thanks for the inspiration. Francine, tes cartes sont adorable !!!! Beau travaille !! Such an adorable card! Love the blue under the image. Really makes the image "pop". What a beautiful card! I love the soft colors! So cute! I love your coloring on this card. Stunning card!! Love the simplicity of the design, colors, coloring and everything about this!! Totally in love with it! Wow!!! How cute and festive!!! Awesome card!!! So very sweet! Adorable birdies, and awesome job on all the fussy cutting! Your card is wonderful. 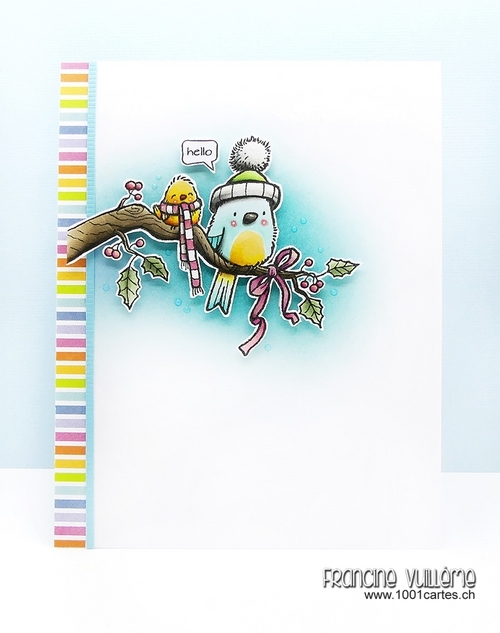 I love the clean and simple look with this stamp, it focuses everything on the little birds. I am going to order this stamp because of your card!! Sometimes simple is best. I like how you didnt over embellish. Very sweet! So sweet. I like your coloring and the striped border. sweet image and wonderful coloring! Fabulous card. Love your coloring. It is such a versatile stamp set. Thanks for sharing. up to fight the cold. So cute and lovely card. This birdies set is simply adorable! 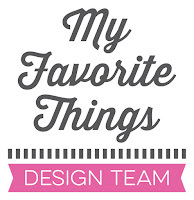 Your sponged background really makes these images pop on this adorable card, Francine! Love how you added the striped papers on the side, too...such a darling card!